You have come to the right place, and have taken a great first step in planning for your next fundraising event. Scott Robertson Auctioneers specializes in expert consultation before, during, and after your live benefit event. From the initial planning stage right through the debriefing meeting that follows your charity’s event, our team understands every aspect of what makes a charity auction a true success. In the past six years, Scott Robertson and his associate auctioneer, Sara Rose Bytnar, helped not-for-profit organizations raise more than 150 million dollars. We want your organization to be our next success. Please contact us today so that we can come alongside you as you prepare your best fundraising event yet! A successful fundraising event takes careful planning and organization. 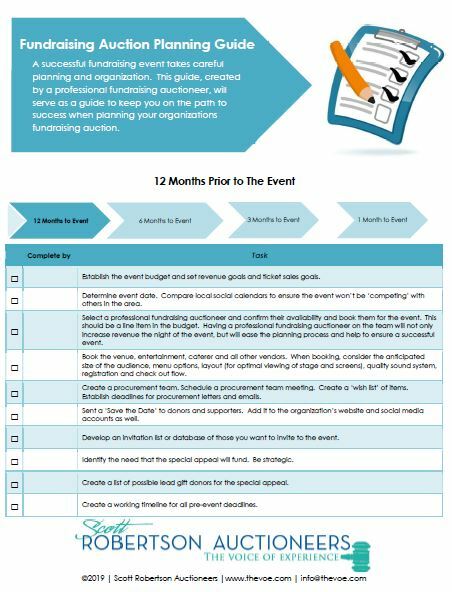 This FREE guide, created by a professional fundraising auctioneer, will serve as a guide to keep you on the path to success when planning your organization’s fundraising auction. CLICK HERE to download this incredible guide TODAY. Hiring Scott Robertson Auctioneers at the beginning will assure a successful conclusion in the end.